In a 50+ page majority opinion, the Federal Circuit has affirmed a district court obviousness judgment. Judge Taranto penned the majority opinion and was joined by Judge Dyk. Judge Newman wrote in dissent — arguing in 20+ additional pages that the majority improperly discounted the objective indicia of non-obviousness. 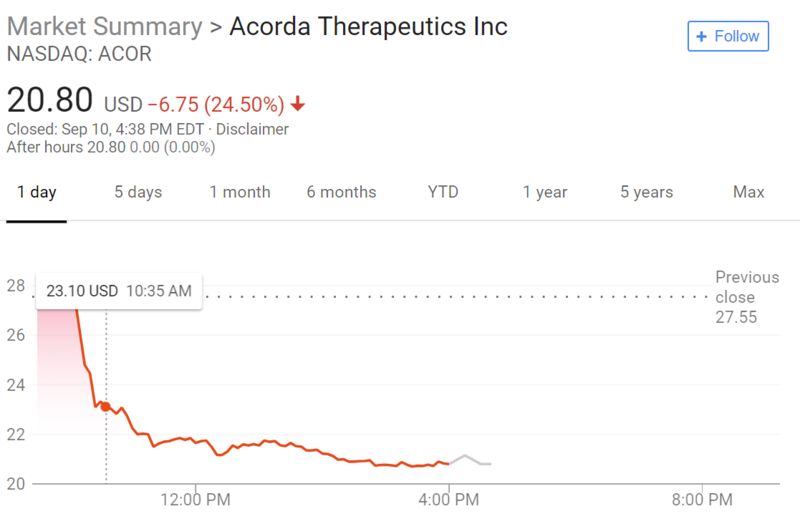 On news of the invalidity decision, Acorda’s stock price dropped 25%. Acorda’s branded drug Ampyra is the only approved pill proven to “help improve walking [speed] in adults with multiple sclerosis (MS).” The patents don’t cover the 4-AP drug itself — 4-AP was already publicly known — but cover particular apparently important tweaks in administration and dosage. (U.S. Patent No. 8,007,826; No. 8,663,685; No. 8,354,437; and No. 8,440,703). Acorda also exclusively licensed an earlier patent (the Elan patent) that broadly covered use of 4-AP to treat MS (but without the tweaks). Secondary Indicia of Non Obviousness: Sometimes the best way to measure the extent of a contribution is by its impact. In patent law, we certainly look to the technical specifications and consider technical differences between a claimed invention and the prior art. However, the Supreme Court has also pointed towards an effects test — known as objective indicia of nonobviousness or secondary-factors. When an invention is a commercial success — that suggests that it probably wasn’t obvious (otherwise it probably would have already been invented by somebody else looking to make money). When an invention arises only after a “long-felt but unmet need”, we think it probably wasn’t obvious (otherwise the need would probably have been met earlier). When an invention is made after others have failed to reach the same goal, we think it probably wasn’t obvious (otherwise the earlier attempts probably would have been successful). When an invention is copied by others, it’s success probably wasn’t obvious (otherwise the copier would have developed it first). In general, these secondary indicia must be linked to the innovation. Thus commercial success will be discounted if due to marketing wizards rather than the invention itself. The big deal with this decision is that the court focused on a new way to discount the proven secondary indicia. Remember that broad Elan patent exclusively licensed by Acorda. The majority explains that Acorda’s commercial success and the long-felt need for advances were due to the roadblock set-up by that patent. “The risk of infringement liability for marketing in the US would have provided and independent incentive [for third parties] not to develop the invention of the Acorda patents, even if those inventions were obvious.” (internal quotations eliminated; this holding, the appellate court finds was supported by the trial record). Although the Elan patent was a US patent — and thus did not block research (FDA Research Exemption) nor did it block international sales, the majority explained that those caveats are “not shown to be weighty.” Several Amici filed briefs in support of the patentee — however, the Federal Circuit found that the friendly arguments failed for lack of proffered evidence. The district court observed that the objective indicia, viz. commercial success, long-felt but unmet need, failure of others, and copying, could change the result, yet discounted its weight on the theory that the patentee had a “blocking” patent. The consequences of this new legal theory are large, as the amici curiae advise. Had the court’s approach to the law of obviousness been in effect when Acorda took up the study of 4-aminopyridine after decades of failures by others, it is questionable whether this new treatment for multiple sclerosis would have been discovered and pursued. The loser is the afflicted public. Thus, Judge Newman would have reversed the lower court obviousness decision and reinstated the patent validity. No doubt, the patentee will petition for writ of certiorari. The 50+ pages of majority opinion appear designed as a mechanism for showing that the case is being decided upon complex facts — a situation less favor for Supreme Court review. In particular, the holding does not create a per-se approach but rather simply affirms that that challenger provided evidence that was not overcome by the patentee. I want to think through how this cuts — most new patents are directed to products or methods that are already covered by one or more prior patents. Caffeine pills also help improve walking speed in adults with multiple sclerosis. In normal (non-MS) conditions, the glib reference may be persuasive, but the MS condition clearly may well complicate any “normal” response to typical stimulants. Newman dissents against Dyk and Taranto on a pharma patent? Obviously those two got it wrong and she got it right, we’ve seen that countless times before. It’s good thing we don’t need new medicines or new treatment protocols, it’s good that new drugs just make it to the market on their own, without any investment by anyone, and it’s great that mor0n!c decision from the Federal Circuit have no effect whatsover on drug development. Is there a pill to prevent Patent Everything Syndrome? Probably something that makes meth/coke less enticing would do the trick for a lot of the maximalists. As it is, the fruits of your cognitive dissonance are provided to all. For more than 13 and a half years now. so I put that number into Espace. And drew a blank! But now I have been given a different USPTO number. And, in Espace, that one worked. A patent does not block improvements on itself. Quite the opposite. The 4-AP patent shared all the knowledge about it with the industry. It removed the obstacles and equipped every researcher with the same starting point to figure out how to administer it. This should weigh against a finding of obviousness – everyone knew how to make 4-AP and the challenges administering it. Yet Acorda was the first to solve it. It it were obvious why didn’t Roxane, Myla, or Teva do it first? And why are they so anxious to copy it now? It it were obvious why didn’t Roxane, Myla, or Teva do it first? This is more of a hindsight argument than anything in the CAFC opinion. Is there a difference between hindsight and impermissible hindsight? I think so, yes. Hindsight per se is inevitable. The court cannot un-know what it inevitably knows about the invention, at the moment when it decides. But ex post facto analysis of obviousness is wrong. Not permitted, in my book. It takes smart attorneys who aren’t afraid to challenge a cr @p law with good arguments. For the record, I’ll note here that I’ve been encouraging attorneys to attack these silly “secondary indicia” for years. They don’t make sense. All it takes is a decent attorney bankrolled by a client who won’t tie the attorney’s hands behind his/her back. The Supremes will destroy logic patents the first time that the issue is properly presented to them, and that will be a great thing for everyone (except for a tiny tiny handful of mediocre patent attorneys). Is that like a logic copyright? a [second and patentably distinct] invention was not invented earlier because competitors are always afraid of patent infringement [of a prior, different, and patentably distinct OTHER patent]! In the abstract this makes sense. The “tweaks” to be entitled to have proven secondary consideration would need to show how those tweaks resulted in secondary considerations that would not exist without the tweaks. For example show a tweak resulted in increased sales that would not have occurred without the tweak. You have changed the discussion. You are saying there must be a nexus for the secondary considerations to be considered. This has always been the case. You are saying there must be a nexus for the secondary considerations to be considered. This has always been the case. First, I don’t think “it has always been the case” that proving the nexus between the invention and commercial success was required. I think the nexus requirement may have been articulated after the commercial success indicia was identified (happy to be wrong about that). Second, whether “it has always been the case or not”, proving the nexus is difficult. That was JS’s point and it’s totally germane to the discussion of this case because this case illustrates how easy it is to misinterpret an observation of a “secondary indicia” (e.g., delayed discovery or an alleged “long felt need”) as evidence of the non-obviousness of a patent claim. I thought that you were happy to be wrong – period. Isn’t that why you are anti-patent? @Night Writer: that seems to be what the majority was trying to say – that there was no nexus between the commercial success of Ampyra and the further research of Acorda that could not be accounted for by the fact that Ampyra had an exclusive license to the Elan patent. Apparently it would have been obvious for anyone else to have developed this successful methodology for using Ampyra to treat MS if they could only have been assured that they would not be infringing Elan’s rights by marketing it. In spite of Elan’s own long-term failure in commercializing those rights which led to them licensing them out in the first place. In spite of Elan’s own long-term failure in commercializing those rights which led to them licensing them out in the first place. But again: was that failure due to the alleged non-obviousness of the alleged invention? Because companies routinely “fail to commercialize” stuff all the time, for all kinds of reasons. @MM – the question is put the other direction. If a product does not exist but there was long felt need for the product, a record of failure of others to fill that need, an immediate commercial success of an invention that does fill that need, and copying by others of the same method, perhaps the solution wasn’t obvious. The Federal Circuit says the invention was obvious, and the only reason nobody else filled that need was because they didn’t own the rights to Elan’s patent. However, that doesn’t seem to square with the fact that Elan also researched the space for years and originally only licensed the spinal damage portions of the patent, retaining the MS portion for their own development, and never came up with the same, commercially viable invention. Elan also researched the space for years and … never came up with the same, commercially viable invention. That is a relevant fact, if it is a fact. But it’s not determinative of obviousness. Not even close. Easy to come up questions: How much time/money did Elan devote to this “research”? What exactly was being “researched”? What did Elan “come up with”? Here’s a little news flash about how companies who employ patent attorneys often work: before they dump a ton of money into something, they analyze what might be deemed obvious and therefore unprotectable and they don’t dump a ton of money into those things. Rather, they wait until someone else develops and commercializes the obvious tech and then — if there’s a market there — they challenge that other party’s patent. The court here didn’t find obviousness in a vacuum, you know. There was a prima facie case and that case wasn’t overcome by unexpected results. Bona fide unexpected results is pretty much the only way to get a reasonable bullet proof patent. And that’s as it should be. Another reminder: the l0 ser here didn’t really “l 0se”. They’ve made a ton of money and they will continue to do so. Use your crocodile tears to refresh a more deserving class of people. (I presume you meant non-obviousness) Of course, no fact in a vacuum is determinative of non-obviousness. And yes, it is pretty much textbook prosecution that the Examiner makes a prima facie case of obviousness, and that the Applicant can attempt to rebut that case by providing secondary indicia of non-obviousness. As for whether “Elan also researched the space for years and … never came up with the same, commercially viable invention” is a fact, just read the opinion. The majority enumerates quite a history of Elan’s research into the use of Ampyra to treat MS while licensing the treatment of spinal cord injuries to Acorda, and yet Elan did not develop a commercial treatment for MS. Only after Elan gave up (see pg 16 of the opinion), was Acorda granted their exclusive license for the MS treatment. And there is also a significant body of case law dealing with types of secondary inidicia of non-obviousness and the required nexus between the secondary indicia of obviousness and the commercial success of the invention. Acorda seems to have gone straight by the book – they presented evidence of long-felt unmet need, they demonstrated evidence of commercial success, they had the defendants’ stipulation of infringement to demonstrate copying of the invention of others, and at the very least they had Elan’s failure to provide an effective treatment for a compound which had been discovered in 1902 and whose use in MS had been studied at least as far back as 1980 to demonstrate failure of others to solve what was a well known problem. Although the majority did not label those bits of information as “findings of fact”, from the opinion as written they seem to stand unchallenged. I don’t know what else you would call them. Acorda attempted to use this evidence to show that, although in hindsight it might have appeared that there were bits of information that could have led somebody knowing the answer to believe it was obvious, the fact that nobody had managed to come up with their solution, or indeed any commercially successful solution, must mean that the solution was not as obvious as hindsight reasoning suggested it should be. This appears even from the majority reasoning to be one of the more detailed, persuasive presentations of secondary inidicia of non-obviousness that I have seen in some time. The Federal Circuit’s answer to me seems to be dismissive – apparently there was no nexus between the limitations that distinguished the invention from the prior art and its commercial success, and the reason nobody else happened on this obvious solution was because there was a patent to a specific formulation of a long-known compound, one component of the invention, owned by an otherwise commercially successful company that had already tried and failed to solve the problem. Any other company who thought they had a way of making the compound work for any disease indication could have attempted to negotiate a license to the compound, or could have developed the treatment on their own to negotiate a cross-license at a later date, but there is no indication that any researcher or research organization felt they were unable to continue research due to intervening patent rights. Several research groups continued to publish the failure to develop effective treatments for any debilitating effect of MS using sustained release 4-AP. As the dissent notes and the majority does not dispute, scientists in many institutions studied and abandoned 4-AP as a treatment for MS both before and after the sustained release compound was developed. And yet, when Acorda does develop such a method of treatment, it was obvious? The only reason that nobody else developed the treatment was because Acorda took the risk that they could succeed where everyone else failed and licensed ahead of time the patent they would need to eventually license anyway? Now we have to not only demonstrate that nobody believed that our invention would ever have worked to be granted a patent on it, but we have to be sure NOT to secure any underlying third party patent rights we might need to commercialize the invention before obtaining our own patent. Again, thanks Mike. Some rational analysis. Or you can show some genuinely unexpected results. You write as if there was teaching away in the art along the lines that what Accorda ultimately did something that people believed could not be done. But there was no such teaching away. On the contrary, people believed it could be done. And it was done. So what if it wasn’t done by Elan? Note that there is a difference between believing that you could make a big profit off something if you invested the time/energy into making it (on one hand) and believing that you could make it, period. There was not sufficient evidence in the record that the field believed it was impossible to tweak dosages/formulations and get a drug that was modestly improved in some respect. The belief in the field was the opposite. Several research groups continued to publish the failure to develop effective treatments for any debilitating effect of MS using sustained release 4-AP. And I bet those papers said it was time to give up and there were no promising avenues for further research in this direction. No? They said something quite different, possibly? You lost as if there were evidence of obviousness. You are conflating several different lines of “thought” in a rather thoughtless manner. “Teaching away” is its own separate line of thought. “Synergy” is its own separate line of thought. My advice to you: aim for clarity and not obfuscation. It is clear that you have your desired Ends and are just shoveling any Means to get there. And seriously, never, ever, waste your time arguing with paid anti-patent troll Melvin Mooney. In Lizard Tech the point was that “a ‘blocking patent’ where practice of a later invention would infringe the earlier patent,” may be become invalid if it is too broad because the claims cover more than is enabled. This is real patent law–not witch law Alice. Here, now we are being told that the prior claims cannot be said to have been too broad based on secondary indicia. Why? This opinion appears to be n aked judicial activism to weaken patents. Let’s remember that real patent law is to go after too broad claims by saying that my claims are inside the scope of your claims, but you did not enable what I did so your claims should be invalid. That is real patent law. Geez, imagine if law professors had to disclose their relationships with corporations or the pay they have been getting from the corporations to burn down the patent system. You could always just ask Dennis to disclose his relationships with corporations, assuming this is what you’re driving at with this strange comment. I see MM you are maintaining your “I only remember what is posted in the last 5 minutes” stance. I’ve posted on this site a link to an article of how Google writes abstracts and then pays “professors” to write the article. These are anti-patent articles. When a claim is examined at the PTO and found to be prima facie obvious, there is at that stage no “commercial success” that can “indicate” non-obviousness ie ride to the rescue of the unfit claim. The false indicator of patentability that goes under the epithet “commercial success” can belatedly magic non-obviousness out of that which, prior to that commercial success, was (in the context of 35 USC 103) obvious in plain sight. Given that this is so, what is the PTO to do then, to be “fair” to its paying customers? Allow every claim to anything that is novel, on the off chance that the claim has within it some finite and non-zero potential to be a future “commercial success”? Should Applicants argue thus, each time they face a 103 objection? I ask in all seriousness. I suggest you read the CAFC Apple decision about 2 years ago on the slide to unlock feature. The contemporaneous applause from the expert audience was considered more persuasive than the hindsight evidence of alleged technical experts. Wow, I actually like a post by Paul Cole. Great morning. I’ll do that, Paul. Thanks for the tip. Can you perhaps give me another tip. I want to read the EPO file on the pending Div that you mention at Comment # 10 in the “mixture of compounds” thread. From Espace I draw a blank. How to I find the EPO Appln/Publn number please? Did you try tracing the provided US number (application 12/426,034) to its related PCT application to pick up WIPO publication number WO 2009/131939 and proceed from there? We see that in its March 14, 2018 opinion, the EPO has indicated patentable matter. It awaits from Applicant a response. Of course, it has to be one in a format, and with a substantive content, that it can work with. Returning to secondary indications of obviousness, today I will at last have time to check out the two sources that Paul Cole (above) kindly points me to. That is some top quality entertainment, that. In parent EP-A-2278885, Applicant withdrew. But that has not deterred Applicant from complaining to the EPO’s Enlarged Board of Appeal about a miscarriage of justice, criminal acts, and so on, and so on. Applicant has changed EPO attorney firm twice already. In Div EP-A-3305083, the EPO has indicated patentable matter. Applicant has yet to respond. Am I right, that no claim has yet got to issue by the USPTO? The publication is EP3305083. You will definitely want to read the “Complaint Letter by Applicant” entries in the file wrapper. Some of them are wild. You can get the divisional number from the EPO register on the parent case. Alternatively simply look at the listing of published equivalents in Esp@cenet. Silicon Valley Bros will applaud for pretty much anything if the person on stage is “hot” in some respect. Not the sharpest people on the planet, by a long shot. I think that you misunderstand the procedural notion of prima facie in your statement. Has the avocado toast patent expired yet? >A patent has been called a “blocking patent” where practice of a later invention would infringe the earlier patent. Well, if one of these things is around then you’re in trouble, except if you own it. Then the “blocking patent” is called abstract and too broad. When an invention is a commercial success — that suggests that it probably wasn’t obvious (otherwise it probably would have already been invented by somebody else looking to make money). A simplistic “theory” that is completely decimated by the myriad instances of a company turning ancient and anticipated products into “commercial successes.” It’s not necessarily about “marketing wizardry”; can also be about merely recognizing a market that, for whatever reason, was forgotten or ignored. When an invention is copied by others, it’s success probably wasn’t obvious (otherwise the copier would have developed it first). As stated, this is just nonsensical in view of the above. Actual theft of something like a recipe or some other kind of shenanigans … that would be different. But arguably people are more likely to copy a successful product that is patented … when the invention is obvious (and the patent is likely to be invalid). Kudos to the Federal Circuit for beginning the thoughtful process of dismantling or at least questioning the “logic” behind these “secondary indicia” (which are, by the way, quintessential examples of “judicial activism” in the patent context; it just happens to be the kind of “activism” that weighs in favor of patent validity, hence the relative silence about it from the folks who otherwise rail against such “activism” habitually). MM: “activism”? As opposed to the whole framework of KSR which is entirely judicial activism that makes it both easier and harder to get a patent because KSR gives power to the fact finder to decide either way. Decimated? So, the theory has been reduced by one tenth? Oh boy a new witch word appears–a blocking patent. If one of those–whatever that means–is present, then you lose all your rights.